The stuff that appears on invoices — product or service descriptions, standard prices, and so forth — needs to be provided up-front to Quicken 2012 by setting up invoice items. Choose the View All Invoice Items command. Display the Business tab, click the Business Actions button, and then choose the Invoices And Estimates→View All Invoice Items command. Quicken displays the Customize Invoice Items window. 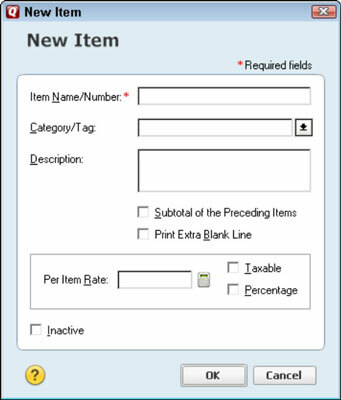 Quicken displays the New Item dialog box. Name the item you’re creating. For example, you might name an item for consulting services “consult.” You just need to use an item name that’s descriptive enough that you remember the item details when you see the item name. Use the Category/Tag box to specify which income category should be used to account for the item and, when you’re running multiple businesses, which tag should be used to identify the business. For example, you might want a “consult” item (which bills for professional services) to get categorized using a “Service Revenue” income category while you might want a “client costs” item (which bills for costs you’ve incurred on behalf of a client) to get categorized using a “Reimbursed Expenses” income category. If you’ve set up two different businesses, consulting and landscape design, and use the tags “cons” and “land” to differentiate, you would enter the “cons” tag into the Tag field for consulting business items. And you would enter the “land” tag into the Tag field to specify for landscape design business invoice items. Describe the item in more detail, please. Use the Description text box to provide the text you want to automatically appear on the invoice for the item. You can (and probably should) be quite descriptive here. Of course, you can add more text to the invoice and edit the invoice item descriptions later on when you actually create the invoice. But Quicken automatically enters the item description for you. You therefore want to make Quicken type up any long, detailed descriptions. Okay, here’s a weird thing about items that appear on an invoice. Anything that you want to put in the body of your invoice is an item. Obviously, the services and products you sell need to be set up as items. But other stuff that you want to put on the invoice — shipping charges, discounts, markups, and so on — also need to be set up as items. After you understand this weirdness, things become more clear (hopefully) about subtotal items. The Subtotal Of The Preceding Items check box, if marked, tells Quicken that the item simply adds up the preceding items shown on the invoice. Probably, by the way, the right item name and description for a subtotal item is subtotal (for the item name) and Subtotal or Total (for the item description). If you indicate an item is a subtotal, by the way, you don’t provide a category or tag. But that makes sense: Quicken grabs the category and tag information from the individual “real” items getting subtotaled — not the subtotal item. (Optional) Add a blank line after the item. To tell Quicken to add a blank line on invoices after an item, check the Print Extra Blank Line box. Use the Per Item Rate to specify a default price for the item. In the case where you’re setting up an item for a service, for example, you might enter the hourly billing rate into the Per Item Rate box. Identify items subject to sales tax. If an item is subject to sales tax — in other words, if you’re supposed to charge sales tax on the item — check the Taxable box. Give the percentage for any percentage-based items. You may not need percentage items for your invoices. But if you regularly bill people for items that get calculated as a percentage of some other item on the invoice, you use a percentage item. Percentage items calculate an amount for your invoice by multiplying a percentage against the preceding item. For example, if the preceding item shown on an invoice equals $1,000, a 10 percent “percentage” item adds another $100 to the invoice. Note that when you check the Percentage box, the value you enter into the Per Item Rate is not a dollar amount but a percentage value. You enter 10 percent, for example, as 10. When you finish describing an item, click the New Item dialog box’s OK button. Quicken returns you to the Customize Invoice Items window. To add more items, repeat the preceding steps. Or click the Customize Invoice Item window’s Done button.